Movie star? My first thought was "what in the world would qualify a movie star for President of the United States"? Being open-minded to good ideas the words came across America with the booming voice of the radio legend, Paul Harvey with reference to the movie star and former governor of California, of all places...Harvey's words changed my thinking in a moment, "It's who he surrounds himself with". From then on I moved from pessimism to unstopable optimism. 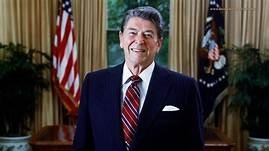 Ronald Reagan was declared our fortieth President, serving 1981-1989. As a Republican it was confessed by one of his Democratic critics, Tip O'Neil, after the landslide victory, "We didn't have anybody to match him". Today marks another anniversary of President Reagan's death (June 5, 2004) due to complications of Altzheimers disease at age 93.